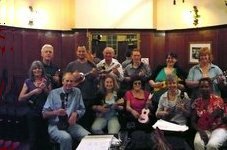 Pompey Pluckers is Portsmouth’s Ukulele Group, encouraging absolute beginners and experienced ukulele players to meet up to jam, sing, learn, talk ukulele, and have fun in an informal atmosphere. A non-profit-making group, we share music skills, perform, and socialise – together, and with our local community. For more information please contact us via our website at http://portsmouthukulelegroup.webs.com/ or email ukesforpompey@yahoo.co.uk.